The development of awareness and intelligence can be seen as the pinnacle of evolution, and it is ever emerging. Cognition and consciousness can be described in many ways, but given the challenge of having to deal with it within the educational and work environment, intelligence can be described in terms of how people make sense of their world and how they learn to adapt. This is often referred to as executive functioning – as it guides and impacts our perceptions, feelings, decisions and behaviour. The better professionals in the field understand these processes, the more effective this valuable asset can be managed to the benefit of all, especially the individual involved. But it is a complex matter, as thinking is a dynamic, integrated, vague and elusive psychological aspect to deal with. In attempting to unpack the concept of intelligence, many theorists have thus throughout history contributed useful perspectives. For current purposes though, the theoretical model of thinking processes as developed by myself, and on which the Cognitive Process Profile (CPP) is based, will be focused on. These thinking processes are measured by the CPP. The CPP is an automated simulation exercise which has been designed to externalise and track cognitive processes according to thousands of measurement points. The candidate is presented with an unfamiliar task. 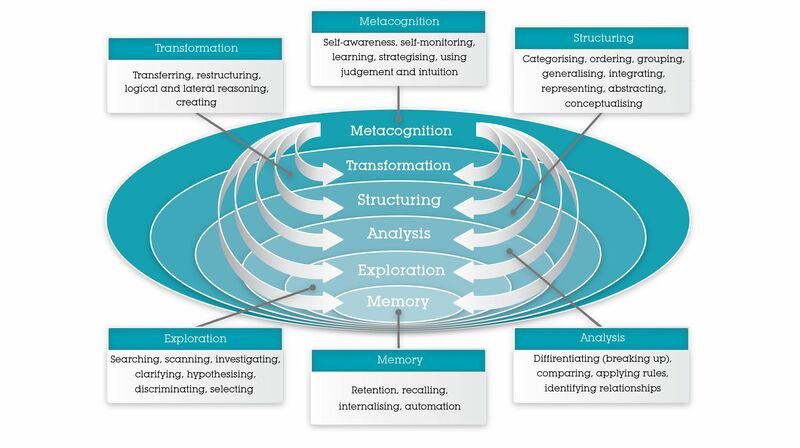 It requires of the person to explore, analyse, structure, integrate, transform and memorise certain aspects, in a metacognitively directed manner, to make meaning of both structured and vague information. The way in which the person performs this task is carefully tracked and algorithmically analysed. A comprehensive report is automatically generated. It indicates the person’s cognitive preferences and capabilities, in other words, their stylistic preferences, the work environment where they would feel most “in flow”, their learning potential, their judgement and decision making effectiveness, their strengths and development areas, and certain cognitive developmental guidelines. This information is most valuable to educationalists and those involved in talent management. The educator can use a person’s CPP profile to see what their career-related cognitive tendencies are. For example, would they enjoy rigorous technical specialist work, or would they prefer fast changing contexts, or do they love the world of ideas? They can also clearly see which metacognitive criteria the person is and is not using currently. Small inputs in this regard can significantly improve the candidate’s cognitive functioning. Educators can also structure course material to address and develop specific thinking skills, and repeatedly remind learners of certain metacognitive criteria by asking questions such as: “Is that necessarily so?”, “Could there be more to this?”, “How are the various elements related?”, “How can you draw a mindmap of all this information?”, “How can you best change / transform your mindmap if the context or the purpose changes?”. With time the learner will internalise these very important metacognitive criteria and start to ask themselves these question thereby becoming more effective thinkers. Within the work environment, talent managers are able to select and place people more effectively by identifying individuals with the right cognitive preferences and capabilities for certain positions. They are able to optimise succession planning and put together diverse teams that will not frustrate, but compliment, one another. In addition they are better informed to suggest or implement developmental initiatives. The possibilities are endless. The information provided by the CPP on a person’s cognitive predispositions, thus significantly informs people decisions. Should you be interested to start using the CPP, you are welcome to contact us.